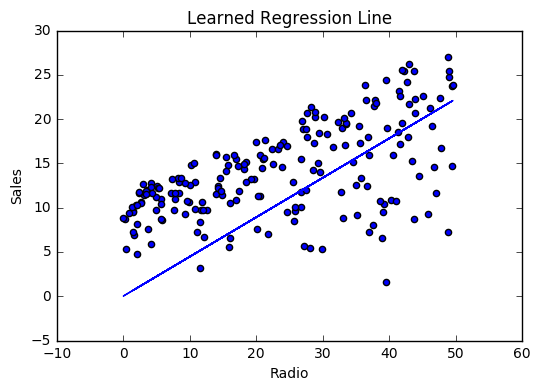 Simple linear regression uses traditional slope-intercept form, where \(m\) and \(b\) are the variables our algorithm will try to “learn” to produce the most accurate predictions. \(x\) represents our input data and \(y\) represents our prediction. A more complex, multi-variable linear equation might look like this, where \(w\) represents the coefficients, or weights, our model will try to learn. The variables \(x, y, z\) represent the attributes, or distinct pieces of information, we have about each observation. For sales predictions, these attributes might include a company’s advertising spend on radio, TV, and newspapers. Our prediction function outputs an estimate of sales given a company’s radio advertising spend and our current values for Weight and Bias. the coefficient for the Radio independent variable. In machine learning we call coefficients weights. the independent variable. In machine learning we call these variables features. the intercept where our line intercepts the y-axis. In machine learning we can call intercepts bias. Bias offsets all predictions that we make. Our algorithm will try to learn the correct values for Weight and Bias. By the end of our training, our equation will approximate the line of best fit. The prediction function is nice, but for our purposes we don’t really need it. What we need is a cost function so we can start optimizing our weights. Let’s use MSE (L2) as our cost function. MSE measures the average squared difference between an observation’s actual and predicted values. The output is a single number representing the cost, or score, associated with our current set of weights. Our goal is to minimize MSE to improve the accuracy of our model. To minimize MSE we use Gradient Descent to calculate the gradient of our cost function. [TODO: Slightly longer explanation]. There are two parameters (coefficients) in our cost function we can control: weight \(m\) and bias \(b\). Since we need to consider the impact each one has on the final prediction, we use partial derivatives. To find the partial derivatives, we use the Chain rule. We need the chain rule because \((y - (mx + b))^2\) is really 2 nested functions: the inner function \(y - (mx + b)\) and the outer function \(x^2\). To solve for the gradient, we iterate through our data points using our new weight and bias values and take the average of the partial derivatives. 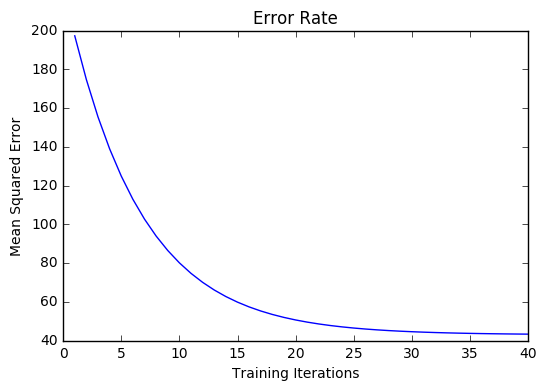 The resulting gradient tells us the slope of our cost function at our current position (i.e. weight and bias) and the direction we should update to reduce our cost function (we move in the direction opposite the gradient). The size of our update is controlled by the learning rate. Training a model is the process of iteratively improving your prediction equation by looping through the dataset multiple times, each time updating the weight and bias values in the direction indicated by the slope of the cost function (gradient). Training is complete when we reach an acceptable error threshold, or when subsequent training iterations fail to reduce our cost. Before training we need to initialize our weights (set default values), set our hyperparameters (learning rate and number of iterations), and prepare to log our progress over each iteration. Let’s say we are given data on TV, radio, and newspaper advertising spend for a list of companies, and our goal is to predict sales in terms of units sold. As the number of features grows, calculating gradient takes longer to compute. We can speed this up by “normalizing” our input data to ensure all values are within the same range. This is especially important for datasets with high standard deviations or differences in the ranges of the attributes. Our goal now will be to normalize our features so they are all in the range -1 to 1. Matrix math. Before we continue, it’s important to understand basic Linear Algebra concepts as well as numpy functions like numpy.dot(). Our predict function outputs an estimate of sales given our current weights (coefficients) and a company’s TV, radio, and newspaper spend. Our model will try to identify weight values that most reduce our cost function. Now we need a cost function to audit how our model is performing. The math is the same, except we swap the \(mx + b\) expression for \(W_1 x_1 + W_2 x_2 + W_3 x_3\). We also divide the expression by 2 to make derivative calculations simpler. Again using the Chain rule we can compute the gradient–a vector of partial derivatives describing the slope of the cost function for each weight. And that’s it! 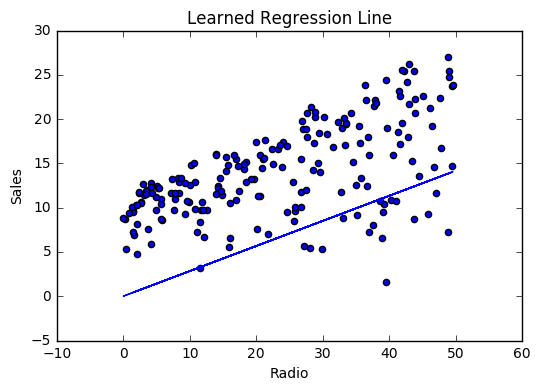 Multivariate linear regression. The gradient descent code above has a lot of duplication. Can we improve it somehow? One way to refactor would be to loop through our features and weights–allowing our function to handle any number of features. 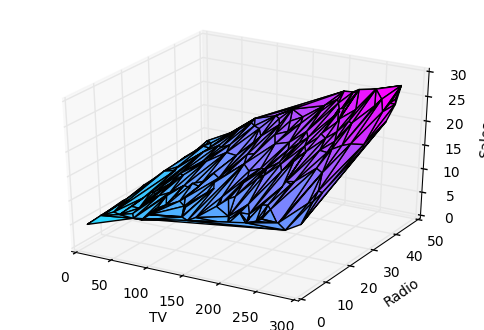 However there is another even better technique: vectorized gradient descent. We use the same formula as above, but instead of operating on a single feature at a time, we use matrix multiplication to operative on all features and weights simultaneously. We replace the \(x_i\) terms with a single feature matrix \(X\). Our train function is the same as for simple linear regression, however we’re going to make one final tweak before running: add a bias term to our feature matrix. In our example, it’s very unlikely that sales would be zero if companies stopped advertising. Possible reasons for this might include past advertising, existing customer relationships, retail locations, and salespeople. A bias term will help us capture this base case. Below we add a constant 1 to our features matrix. By setting this value to 1, it turns our bias term into a constant.